For weather and flight schedules of Airports all over the world, click Here. This is an excellent reference to questions and potential best responses to difficult interview questions. Written in a nononsense conversational style this book covers everything you need to know about an interview before, during and after the interview. 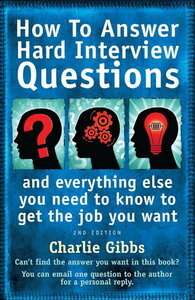 In this book, experienced interviewer, Charlie Gibbs provides valuable advice on how to prepare for your interview, how to conduct yourself at the interview and, most crucially perhaps, gives examples of the sort of questions you are likely to be asked, with the kind of answers interviewers really want to hear. Common interview questions included are on your - drive for achievement - strategic thinking - relationship building - commercial awareness - leaderships skills - decision-making skills and judgement - customer awareness - development of self and others - teamworking skills You'll also find some good ideas for questions you can ask your interviewer. For twenty years author Charlie Gibbs has been on the side of the desk where sits that scariest of dragons: the interviewer. The sheer variation of quality in performance of interviewees prompted him to distil what he has learned into one, manageable body of advice that will give you the edge when it comes to getting that job.